Synyster: "It started quite a few years ago. The people at Activision were just some of the coolest people of all time. We've been friends with the 'Call Of Duty' folks for some time and it's been really such an honor that they keep bringing us back. We've been into video games and written songs for them and we've haven't blown it. [Laughs] So, we really appreciate it. It's been a lot of fun." Synyster: "Well, they put a lot of trust in us to write while they're creating. We're lucky that this time around the song worked. We sent them a song out of the blue and had a little bit of content, some basic imagery, but really no context. As I said, we're really lucky they trust us and we have a strong relationship there. I think it boils down to the good relationship and the fact that metal music in itself lends itself pretty well to high-intensity games like that and zombies." Synyster: "I don't have any problems with it. It's up to parents to parent at their discretion and it's up to us to write music that we love." Synyster: "I just think rock music doesn't stream as much as other music, so I think hip-hop and pop is a lot more lucrative for streaming services. I personally don't hate on them for doing smart business. It hasn't affected us. Obviously, we could make more money off of streams than other platforms, but it's our job to write great music that hopefully brings a broader audience to those platforms. I think it will turn around. I really do. I don't think it's a numbers issue — it's a demographic. Fortunately for us, our audience still buys CDs and iTunes. They're kind of newcomers to the monthly subscription-based streaming platforms. Once those things turn around and become ubiquitous in all cultures, you'll see those things turn around and it will be more profitable for younger artists. We're happy, we're good, but the up-and-comer metal band definitely has it a lot tougher than we ever did." Synyster: "Yeah, that's 99.9 percent of it for us. Unfortunately, you can't download a shirt or live experience. I'm sure that will happen soon. Until it does, we still have a job and we enjoy those things. We're very lucky to be able to play big, successful shows and we don't take it for granted and we appreciate the fans for that." Late last month, AVENGED SEVENFOLD released a new version of the song "Mad Hatter" in response to fan complaints over the original version's mix. The track was recorded for the "Call Of Duty: Black Ops 4" video game and was first made available online September 17. The track is included on the band's new EP, "Black Reign", which was issued on September 21. 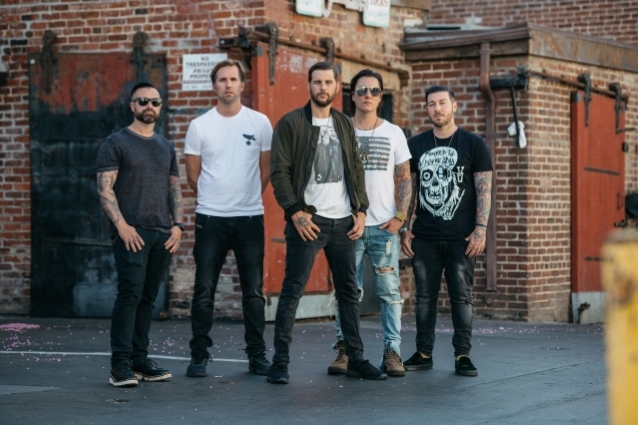 "Mad Hatter" was recorded in Los Angeles this past March and is the first original new song AVENGED SEVENFOLD has released since last year's "Dose", which originally surfaced in the Gameloft mobile game "Dungeon Hunter 5". It later appeared on last year's "deluxe edition" reissue of "The Stage".